With two-sided XL Ambilight ready to flood your room with coloured lighting, the Philips 42PFL6188S Smart TV doubtless has a rather broader appeal than its mid-range rivals. It's also well specified when it comes to connectivity, and offers Miracast mobile screen mirroring. The set ships in four screen sizes: the 32-inch Philips 32PFL6188S, 47-inch Philips 47PFL6188S and the cinema-sized 55-inch Philips 55PFL6188S, but does it have what it takes to make it into our list of the best TVs to buy? Scratch Ambilight from the features list and you're left with a box-ticking Internet TV proposition. Streaming services consist primarily of iPlayer, YouTube, Blinkbox, Viewster and iConcerts. To help navigate these, the supplied remote is flappable, with a QWERTY keyboard on the reverse. Multimedia file support from both local USB and across a LAN is fine, with all key codecs playable. Minimalist and understated, Philips plays the designer card well with this set. We love the edge-to-edge screen and minimal picture border. The addition of mood lighting doesn't impact depth significantly either. You can use Ambilight either dynamically, reflecting hues from onscreen content, or as fixed illumination, coloured red, blue or green. Connectivity is solid, with four HDMIs, component, Scart via an adaptor, digital audio optical out, Ethernet plus a trio of USB inputs. The set also boasts integrated Wi-Fi with Miracast streaming. There's a choice of either a Freeview HD tuner or DVB-S2 satellite. 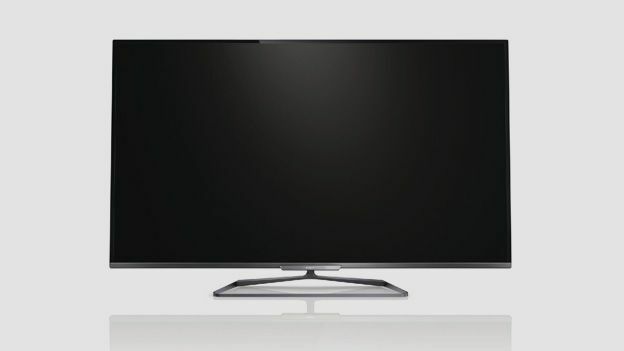 Philips TVs traditionally are complicated to set up, and the 42PFL6188S is no exception. While the main GUI is relatively intuitive, the picture menu offers a multiplicity of head-scratching options under the Pixel Precise HD banner. Perfect Natural Motion needs to be enabled to obtain a reasonable level of motion clarity, but all available settings contribute motion artefacts. Black level performance is suitably noirish, with detail retained in shadows. Ultimately, if you like preternaturally crisp Full HD images then this is your kind of gogglebox. Sonically the set sizzles, with a 2 x 12W sound system that's not short on punchy mid-bass. There's much to like about this good looking screen, although it's not without its foibles. Build quality is excellent; the bezel is fashionably narrow and the TV feels substantial. We can forgive the short-changed Smart portal too, thanks to the joyful illumination of Ambilight. The simplified UI and Spartan EPG are a little harder to ignore. While it takes some effort to eek the best image quality from the panel, diligence is rewarded with extremely crisp detail and a decent black level performance. Overall, this set is worth checking out. Read our guide for which TV you should buy.